A free, public STEM high school in Herriman, Utah. RSL Academy High School is excited to announce that our board of directors has approved a new class schedule for the 2019-2020 year. This change includes two components not being done anywhere else in Utah. With the unique student body we have, one that is comprised primarily of students who play high level soccer, it was evident that Friday was emerging as a day where many students missed class. We attribute this in large part to our student-athletes traveling to soccer tournaments. At RSLA we strive to have no more than 15-20 students in a class. When a small class is missing a lot of students, it is hard for learning to take place.Facing this challenge of how to solve the Friday attendance issue, an outside the box solution presented itself. 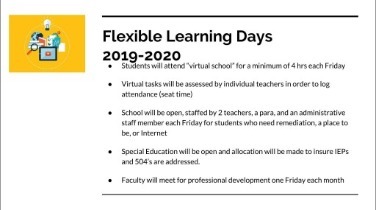 Friday will now be a day of flexible, blended learning. It means that our students will have the option of coming to campus, learning from home, or learning on the road. All of the instruction for the day will be placed online in the class Canvas account. Canvas has several options available to facilitate learning from a distance, and as an added bonus is the platform being used by a vast majority of colleges.Real Salt Lake Academy currently uses 1:1 technology, providing every student with a Chromebook. This push towards using technology in the classroom has always set RSLA aside as a forward thinking school, and now makes a move towards a blended learning model a natural progression. We think that the future of our students as college bound young men and women is one of blended learning. College campuses nationwide have moved forward with an emphasis on online classes and remote learning opportunities. We believe that our Flexible Friday blended learning model reflects how education is evolving. Our second unique class schedule component is the combination of a traditional schedule and a block schedule. More and more studies are showing that 90 straight minutes of instruction is not the most effective method for a majority of students; however, for some classes and in some situations it IS the best way to cover a certain topic. So at RSLA High we have decided to implement the best of both worlds. Monday we will run a traditional schedule where the students attend all 8 of their classes. This gives them to opportunity to see every teacher and go over what was learned from Friday until then. This touchpoint with our students will set them up for success moving forward, and will intervene early for those who may have gotten off track over the weekend. Tuesday and Wednesday the students will get a chance to have a 90 minute class in two days of block scheduling. This allows the teachers to cover topics in greater depth, to work on projects, it facilitates classes with labs to get those accomplished, and in general will be an exciting time to extend instruction. The students will be sharper and more focused as they only have two days of these 90 minute blocks. Then on Thursday the students will again go through all 8 classes and get important instruction not only on the day, but get set up to succeed Friday-Sunday. We are so grateful for our outstanding staff and supportive board. A small charter school such as ours has the ability to move deftly and quickly when faced with an issue. To have such a dedicated and intelligent staff further allows us to come up with these types of solutions and implement them quickly and efficiently. 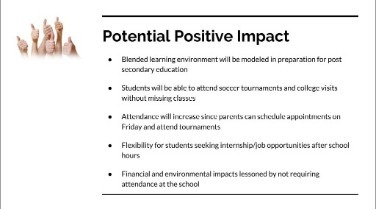 We have no doubt that our ground breaking schedule changes will be a model to follow for future schools. It reflects the type of learning that goes on at the college level and perhaps even more importantly it serves our student body in the best way possible. It gives our students and staff a flexible, blended learning platform and it recognizes the need of today's young person to not be contained in a room for 90 straight minutes. Yet brilliantly, by having the school open and staffed on Fridays, we also accommodate those students who DO learn best by being in a brick and mortar school. We accommodate those students who may not have internet in the home or who may need the stability of attending and being at our physical school 5 days a week. We couldn't be more proud of our agile response to a unique challenge. Our goal is to serve our students with 100% commitment to their success. Anybody with questions about this model, or who just want to learn more about our school are welcome to come and visit campus and take a tour. We have school tours Tuesday mornings at 9:00am or Thursday afternoons at 3:00pm. Real Academy is designed for students of the 21st century. Real Academy encourages students to choose their path of study and their pace of advancement through project based learning, STEM curriculum, college preparatory classes and state-of-the-art online curriculum within a small, cohesive educational community. Our Schools Mission and Vision define how we go about the policies, programs, goals, and curriculum at our school. The mission of Real Academy is to educate, empower and equip our students for the life they choose while at school and beyond graduation. Within a small, caring community, our laser-focused educational STEM program design provides each student with an individually crafted learning experience through the use of cutting-edge technology, project based learning, dynamic teaching and holistic mentoring. We believe it is essential for secondary students to understand they are in control of their educational experiences and their paths to successful futures. We believe the most important factor in a secondary student’s educational success is their relationships with superior teachers who empower students by providing guidance and encouragement. We believe teachers should be mentors who understand their student’s strengths and weaknesses and who coach each student through their secondary education experience. We believe current technology coupled with a STEM curriculum provides a powerful tool for individually-tailored student learning and for real-time assessment of progress to inform, encourage and guide students and their teachers. To help us accomplish our mission and vision as a school Real Academy will use a blended learning model, with a combination of online classes, traditional classes, and classes designed in a workshop/lab style. Classes may be a combination of all three styles. Online Courses will be accessed through Edgenuity. Edgenuity is NCAA Approved and provides curriculum, real-time data, a virtual teacher, a "success" coach (like a counselor), and an "academic coach." Part of the program includes an onsite mentor/coach. 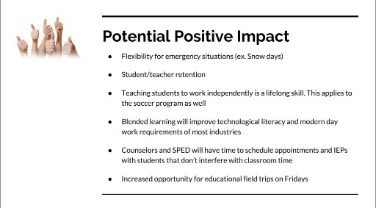 Real Academy will use paraprofessionals to provide this role. Real Academy offers five possible emphasis (pathways) for students to follow to graduation. Science (Biotechnology), Technology, Engineering, Math, and Sport Business. In order for students to have more flexibility in their schedules and provide additional coursework in areas of emphasis, Real Academy will use competency-based education. Utilizing competency-based education provides students the opportunity to demonstrate what they know and are able to do and allows students to adjust their PEP plans accordingly. This process would also have the potential of increasing students' options for specific pathways, concurrent enrollment, and internships. 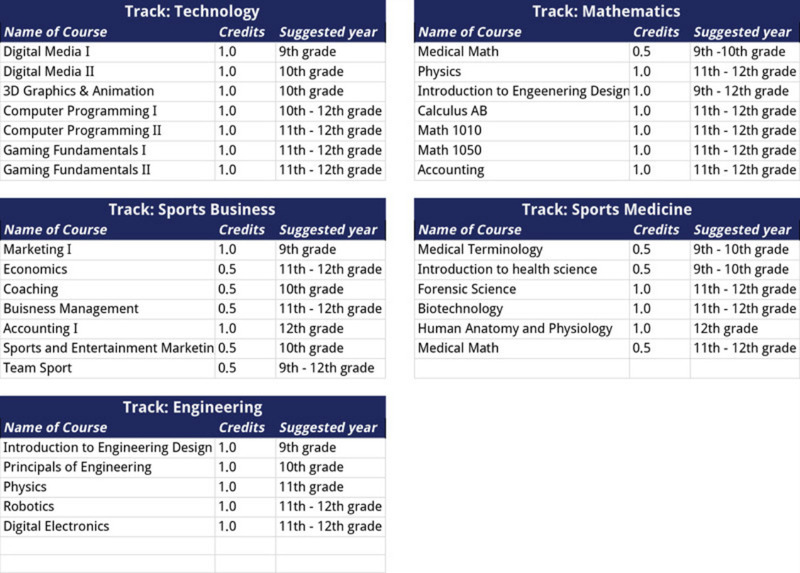 The course sequences/pathways for the five areas are listed below. All students at Real Salt Lake Academy are required to choose a track of study. Students may switch their track of study if they feel they are no longer interested in that particular track. Students must complete at least 4 credits in each track to be recognized as a track completer at graduation. 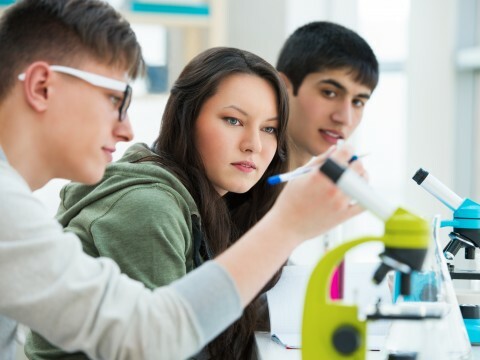 A tuition-free, public STEM charter school serving grades 9-12. © 2019 REAL Salt Lake Academy. All rights reserved.